Sophia Chen from MLK Magnet Charter School records B-roll for a video project at the Campus Recreation Center outdoor pool during the Innovation J-Camp in July. Perkins, a rising Blackman High School sophomore, was one of the 21 students enrolled in the first MTSU Innovation Journalism Camp held July 13-17 at the Center for Innovation in Media in the John Bragg Media and Entertainment Building. Center Director Val Hoeppner, along with Journalist-in-Residence Whitney Matheson and Dean Ken Paulson, led the aspiring journalists through a profession that has gone high-tech and digital. Hoeppner kept the focus on telling cohesive stories for mobile, social, digital and video audiences. Matheson focused on interview techniques and identifying “what’s news.” Paulson taught free expression, the First Amendment, story structure and writing profiles. 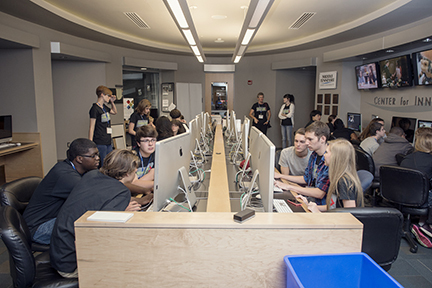 Members of the Innovation J-Camp edit their video projects in the Center for Innovation in Media. The students later delved into music and the media with Greg Reish, director of the MTSU Center for Popular Music, as well as learned about photography and photo editing software. By the end of the week, students were shooting and editing 60- to 90-second videos, building websites and sending their videos to YouTube. The students recorded interviews and shot “B-roll” video clips at a number of campus venues, including a coding camp in Kirksey Old Main, Ben Speer’s Stamps Baxter School of Music in the Wright Music Building and at the Campus Recreation Center. Hoeppner said she is considering making the second Innovation J-Camp in 2016 a two-week experience. The camp was a partnership between the Center for Innovation and Media and the College of Media and Entertainment. For more information, click J-Camp. Click on the links below to take a look at the work completed by the fledgling journalists.